Question: I have a casting problem. My backcast is fine, but when I come forward, the line kind of dies at the end. This is especially true when I try to lay the line down. What am I doing wrong? Many of us do a natural “haul” with our line hand on the backcast; but moving the line hand toward the stripping guide on the forward cast is a common error and can cause loss of line speed. Jacom Stephens photo. Answer: It’s pretty hard to diagnose a casting problem without actually watching you cast, but this is a very common technical flaw that robs many anglers of a good forward cast. My fishing buddy and sometimes photographer Sandy struggles with this same problem. When we were bonefishing in the Bahamas, he had a very difficult time punching his line out to the fish. His line would unroll beautifully behind him, but every time he tried to lay it down, the line would collapse well short of his target. If you’re like Sandy, the problem lies with your line hand. The key is to look at the length of fly line between your line hand and the first guide (called the “stripping guide”) of your fly rod. On your back cast, you probably increase the distance between your line hand and the stripping guide, which means you’re actually performing an unintentional single haul—thus increasing the line speed and creating a well-formed backcast. That’s good. The bad part is that when you come forward, you are probably doing the opposite. During the forward cast, does the distance between your line hand and the stripper guide decrease dramatically? If so, instead of hauling on the line, you are in fact feeding slack into the cast. This is what robs you of power on the forward cast because the slack you feed upward through the rod guides “unloads” the rod somewhat in the middle of the cast. As a way to illustrate this, try these two experiments. 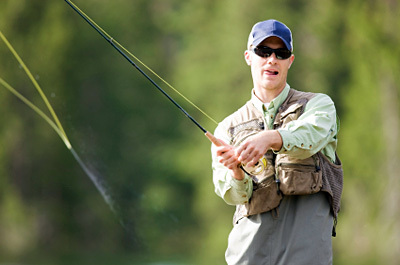 First, trap the line against the rod with your rod hand, leaving your line hand out of the process altogether. Start false-casting with about 20 feet of line and watch how the rod works. As you accelerate the rod, either forward or backward, the rod “loads”—meaning it bends, storing potential energy. When you stop the rod, the rod “unloads” or unbends, and the transfer of energy from the bent rod to the line is what accelerates the line. Now attach the end of the line to something (or have someone hold it). Take the line into your line hand, with about 18 inches between your hand and the stripper guide. Pull back on the rod until it bends, simulating a rod under load. Now move your hand toward the stripper guide and watch what happens: the rod unbends. This is effectively what you are doing on every forward cast. Okay, that’s the problem. How do you fix it? I asked my friend Macauley Lord, long-time instructor and director of the L.L. Bean Fly-Casting School, and his answer surprised me. The double haul is considered a pretty advanced cast, but it’s not all that difficult to learn. Luckily Tom Rosenbauer’s article or Joan Wulff’s video right here on Midcurrent will get you started. The best part of this process is that you’ll force yourself to go from being a problem to caster to an accomplished one lickety-split. Once you learn the double haul, a whole new world of casting and fishing will be open to you. Good luck.